This is our second year putting Schole' into practice in our community. As a director I get a chance to talk to many families and see the curtain pulled back on the inside of their homeschooling life. I find that the obstacles to Schole' often fall into the same general categories. I have struggled with some of these too in the beginning, and I have had to prayerfully find my place of Schole' within our homeschool. I wanted to share some of my observations in the hope that these insights will help you to find a more restful place of educating your children and putting Schole' into practice. 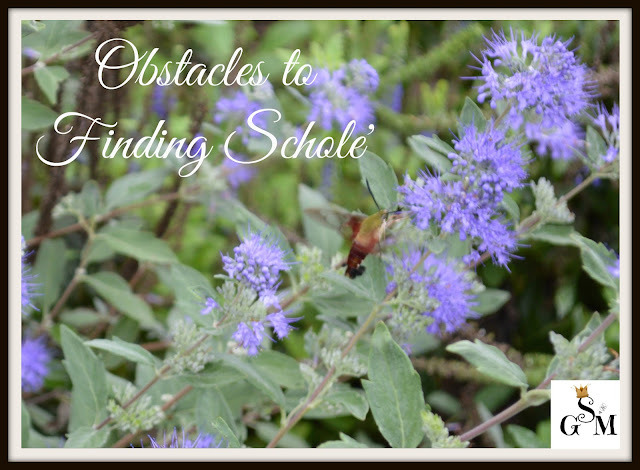 A large obstacle to finding Schole' is overcommitment to outside activities. Homeschoolers no longer lack for activities and socialization, now we struggle to fit school in between all the socialization and activities! Many of the things available have value and a place in the education of a child, the amount of time devoted to them and the number of them that a child should be committed to at any given time can definitely affect your ability to teach from rest. Often families will have students enrolled in multiple activities at one time. Things like sports teams, theater productions, art classes, music lessons, scouts, AWANA, STEAM activities like First Lego League, Science Olympiad Teams, and more. It's hard to find restfulness when most of your days are spent rushing in and out of the car each day, and often many of these have components of work that is required outside of the actual attendance day, such as large amounts of memorization. What you choose can definitely affect your restfulness. Choosing heavy weighted curriculums (you know the ones that are written as if that's the ONLY subject you are teaching this year) can swallow up restfulness. Our view of curriculum can also steal restfulness from us. If we feel we must fill out every page and follow each script, regardless of our student's abilities, we are robbing ourselves of restfulness. The last area of curriculum that can make restfulness allude us is repeating what we grew up with (most of us weren't educated classically) and viewing education within those narrow constricts. Perpetuating what we know or was done to us educationally can prevent us from finding restfulness. There are a few things that can cause us to homeschool by the tyranny of the urgent. Living without established routines and rhythms - having your day laid out into rhythms and routines will help keep things running smoothly. Failure to think goal orientated vs. lesson plan driven. Plan your school year based on the goals for your student and not based on written out detailed hourly lesson plans that are often doomed to cause stress or not be met. Loop scheduling or goal scheduling are most realistic for restful learning. Over-commitment - basing your day on the various outside commitments you've made rather than deciding on outside commitments based on your school workload. Child centered thinking - not wanting them to do things that may be hard for them or things they may not prefer or like. We should all be diligently pursuing the things that are true, beautiful and good. Instilling virtues into our children, both as human beings and students. We should pursue an education that is diligent, goal orientated and deeply woven in God's Word. Rigor = rigidity. Diligence = careful, persistent effort. Rigor can kill the love of learning. Diligence pursues it. This doesn't mean we don't make our students do hard things or do things they don't like. It does mean that we approach those things with wisdom and consistency, not rigidity and fear. We are all good at some things and not at others. That's how God made us and we should encourage our children to pursue more deeply what academically motivates them, and allow that pursuit to be done with the passion God has given them for it, while still requiring what is needed in others subject matter to maintain balance and meet educational standards for your state/grade. Many of the above things I've named have their roots in fear based homeschooling. Fear of failure, fear they won’t fit in with other kids, fear they won’t match up, fear you aren’t doing enough, fear your students will be behind, fear your child won’t be happy, fear they won't get what they would at public school (let's hope not! ), fear they won’t have what others do, fear they won't get a scholarship or get into a particular University, and the list goes on. We have to remember that God is sovereign over the lives of our children and our homeschool. God didn't hand homeschool control over to us completely. We are a part of His plan for our children's lives but He has the plan. We can't deny them what God has ordained for them. If we are seeking His priorities and His wisdom for our homeschool and truly living to His standard and not the world's, our kids will be more than fine. They will be better off. I don't know about you, but I'm OK with my kids not fitting in the world if that means being addicted to electronics and having no virtues. Now that we've identified some of the obstacles, lets identify some of the things we can do as homeschooling parents to find freedom and restfulness for ourselves and our children. Goal orientated thinking is best. Think about the goals you have for your student for the year and then think about how you will achieve those goals. You might be surprised at how much you don't need a boxed curriculum if you look at things this way. Be a weaver not a doer. Look at curriculum and see where other things are being woven in. Are you using Writing & Rhetoric as your writing curriculum for example? Then recognize all that is being covered. They are doing more than writing. They are doing reading comprehension, vocabulary, copywork, grammar, dictation and some history/literature. Take that into consideration when you are deciding on what additional curriculums you need to add. Don't overload your child and create imbalance with what is already woven it into their curriculum. Make hard choices. Give up the good for the best. Temporarily let go of something for a season to pursue something else. Make your children make choices and don't just add to your full plate! If your child wants to do theater, then maybe they give up a sport or dance lessons for that season. Form good habits. If students develop good work habits that are overseen by parents (don't send a child to a place you can't see them and expect they will be "working" on their schoolwork and then wonder why they didn't accomplish all you sent them in with or found it too "hard" and think the workload is too much. It is more likely, they just haven't been properly taught good work habits and weren't very diligent.) More can be accomplished in less time if a student knows how to work. Rhythms can help with this habit formation. Create MARGIN in your life and schedule. This is imperative! Plan for a portion of the hours you have available in a day. Don't plan every hour out in your day. Good things happen, and we miss them when we are tied down to our schedule and plans that don't allow for margin to pursue better things. Life without margin is life without rest. Margin provides rest and time for contemplation and good discussion. You need margin for those important conversations! Allow your kids to be bored. This is the mother of creativity. Don't feel you are the activities director of your children's lives. They will be better off if they have time to be innovative, and are bored enough to create!